Our flagship award winning abba superbike stand has been leading the way for over 25 years, with its simplicity, versatility, ease of use and unrivaled quality. The abba superbike stand, with the appropriate fitting kit, fits well over 350 different motorcycle models. Numerous "add ons" enable you to lift the front end, raise both wheels simultaneously, remove the swing-arm and even maneuver your bike around in confined spaces. With all these advantages and many more its easy to see why the abba superbike stand is widely considered to be the most useful & versatile stand on the planet! 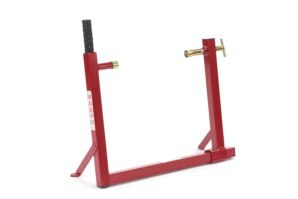 Looking to purchase your first motorcycle stand? Or maybe your currently struggling with the awkward, tedious and risky balancing act required to use a conventional paddock stand safely on your own? Either way look no further than the abba Superbike Stand. This total one person operation stand fits onto the swing-arm pivot of the motorcycle. The beauty of the abba superbike stand is it can be simply fitted when your bike is leaning on its own side stand therefore eliminating the need to hold the bike upright whilst trying to fit a stand to the bike, as you would have to do with a conventional paddock stand. The bike can then simply and safely be lifted into the upright position using the integral telescopic extension lever. The abba Superbike Stand requires no modifications or parts to be fitted to your bike whatsoever, your machine stays totally standard. Should you change your motorcycle its a simple case of upgrading your fitting kit for your new machine, fittings can be changed on the stand in a matter of seconds. 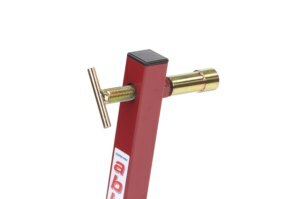 The abba Superbike Stand locks to both sides of your bike, ensuring rock solid security when your bike is fitted to the stand. But don't take our word for it! Take a look at 100's of customer reviews (tab above) and multiple motorcycle press comments (below). Not to mention the stand is used by motorcycle manufactures, dealers, race teams, MOT stations, UK Police Forces as well as 10,000's of satisfied customers worldwide. 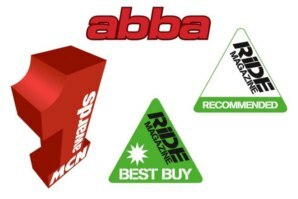 We are also proud to boast the abba superbike stand has won an MCN product award and 2 Ride magazine recommended triangles! You can buy both the abba Superbike Stand & abba Front Lift Arm at a discounted "package price" here. abba Superbike Stand Leaflet - (PDF File)- you can view our latest promotional leaflet. abba Superbike Stand Gallery - Want to see your bike on the abba superbike stand? We should have it here. 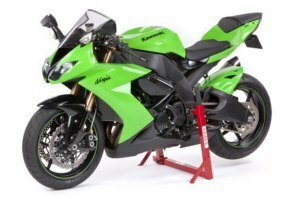 Fitting Application - If you need more detailed information on where the superbike stand fits your bike, or how our fitting kits work you should find it here. Product instructions - Can be viewed or downloaded (PDF file). Totally safe, 1 person operation - guaranteed! Extremely stable and secure, as the abba superbike stand locks onto a solid point it is far more stable than a conventional paddock stand. Both wheels can be safely suspended off the ground at the same time when used with the abba front lift arm or even your own jack/prop. No fittings needed to be permanently fitted to the bike, your machine stays totally standard. 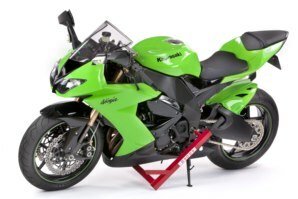 The abba superbike stand fits both single sided and twin sided swing-arm motorcycles, there is no need to change your stand if you change your bike. 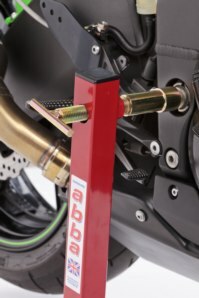 The abba superbike stand will not scratch any part of your swing-arm, unlike most conventional paddock stands. Does not restrict access or get in the way when working on the wheels of your bike, unlike paddock stands. Extremely compact when not in use, can be hung on the wall and will take up far less space than any other motorcycle stand. Fully welded construction, No "flat pack" type assembly, no cheap plastic parts. Built to last! The unique bespoke fitting kits allow this stand to be adaptable to fit over 350+ different models of motorcycle. When fitted to your bike the abba superbike stand adds extra security against theft. 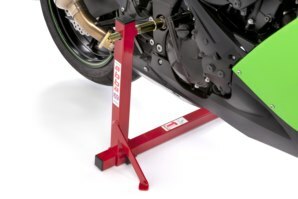 Many "add-ons" can be purchased for the superbike stand to store tools, lift the front wheel easily, manoeuvre your bike around, remove the swing-arm as well as fitting kits to fit over 300+ motorcycles. 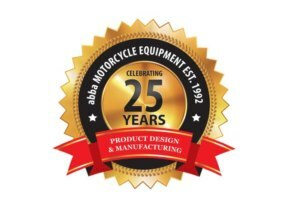 All abba products are made in the UK at our headquarters in Essex by skilled engineers with over 30 years experience in the motorcycle industry. Made to the highest standards and all backed up with a full guarantee. Unsure of anything? Give us a call, you will speak to a real human with technical knowledge of the product any happy to advise you on any questions you might have. A video showing just how quick and simple it is to fit the abba Superbike Stand to your bike. No complicated assembly, no modifications to your bike, no tools required, no fuss. From the delivery box, fitted to your bike in under 3 mins - Job done! Viewing records 1 to 5 of 226. Before buying any bike related product, I research the options throughly and ask as many members of bike forums as possible. Again and again I was being told that the only bike stand worth buying for my Hayabusa was the Abba stand. Now I've used it I can only say I am a convert. Your product is a revelation! It was so easy to use and made my routine maintenance a doddle. Absolutely brilliant!! It does what it says on the tin. Having bought a paddock stand previously and nearly had heart failure every time I used it on my own because it was so fiddly, the Abba Superbike Stand has made all my maintenance tasks so much easier due to its simple one man operation. Simply the best on the market. Biking for more years than I care to remember and used quite a few stands along the way. The Abbastand is something else so simple to use, no balancing acts whilst trying not to drop your pride and joy. Delivered within one working day of ordering, excellent value for money and such a quality product. What more could you ask for? The stand was recommended, I researched it, ordered it and two days later it was supporting my pride and joy whilst I had full access to work on the back end of my bike. Believe me I wouldn't allow the stand anywhere near a £11,800 bike unless I could fully trust it and trust me I can. 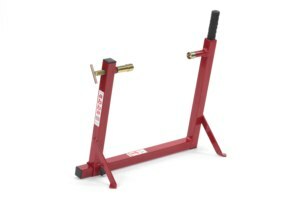 How do I Know if the stand fits my bike? Do I need to modify my bike? Absolutely not! With the abba superbike stand your bike will stay totally standard, no modifications or parts to be fitted. Is it safe to leave my bike on the abba superbike stand long term - i.e winter storage? What do I do if I change my bike and need a new fitting kit? You simply order a new one... most common kits cost £18.50. You can order either by telephone or on the fitting kit page of our online store. Kits are updated each year for new models. You can also use our Fitting Kit Compatibility Tool to see if you require a new fitting kit for your new bike. 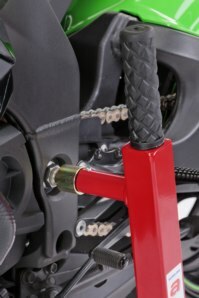 Your stand fits on the swing-arm pivot, how can I remove my swing-arm? 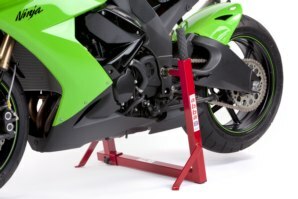 We sell an optional swing-arm removal kit which fits onto the footrest hanger mounts. This then allows you to fit the stand with access to the swing-arm pivot, in this mode you can strip the bike down to the bare frame. I am unsure of the exact location of where the stand would fit to my bike? The Superbike Stand always fits to the "Swing arm pivot" on any motorcycle. If you are not familiar with the terminology "swing arm pivot" and its location please read our article here that will explain this in more detail. Will it scratch or mark any part of my bike? 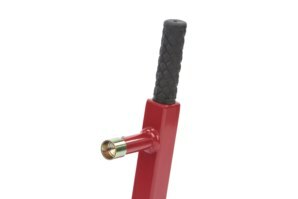 Unlike paddock stands and other motorcycle lifts, virtually all our fitting kit are designed to fit onto the swing arm pivot bolt heads and do not come into contact with any part of the motorcycle swing arm or frame. Typically are fittings fit over the swing arm pivot bolt head or inside the bolt hole or hex, just like fitting a socket/spanner or Hex key. No part of the set up has to be permanently attached to the bike, once your motorcycle is off the stand you would not ever know it had been fitted! Will the abba superbike stand work on my workbench? The abba superbike stand will fit on some workbenches, depending on the width of the bench. You will need a bench width of 26.5" or more. If the bench is not wide enough its a simple case of using a piece of ply board to splay the width of the stand across the bench. Does the abba superbike stand come with a guarantee? How can I obtain the product instructions? We have a page dedicated to product instructions this can also be found with other customer information under the "support tab" above. Got a Question about the abba Superbike Stand? If you would like to ask us a question about the abba Superbike Stand, simply fill in the form below and we will contact you within two working days. Want to tell a friend about the abba Superbike Stand? Alternatively fill in the form below and we will send an email on your behalf to your friend, with a link to this page all about the abba Superbike Stand.